Dangerous far-away Pin. This position was taken from a game Carlsen - Leko, Dortmund 2007. White played Re3 Draw. What would have happened after Qxd6? 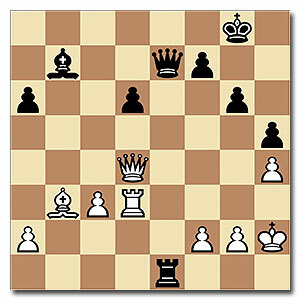 This chess puzzle is from our award-winning chess training podcast database www.chesskillertips.com. All super chess puzzles for free! The podcasts are hosted by Chess Queen Alexandra Kosteniuk. The Chess Men of Mars + Funny Alien Chess Video! Street Chess in the Middle of a Mall! Cool Chess Short Story for the Weekend!